WOLVERHAMPTON claimed their first point away from home since April despite slipping to a narrow 48-42 defeat against fellow strugglers Leicester at Beaumont Park. 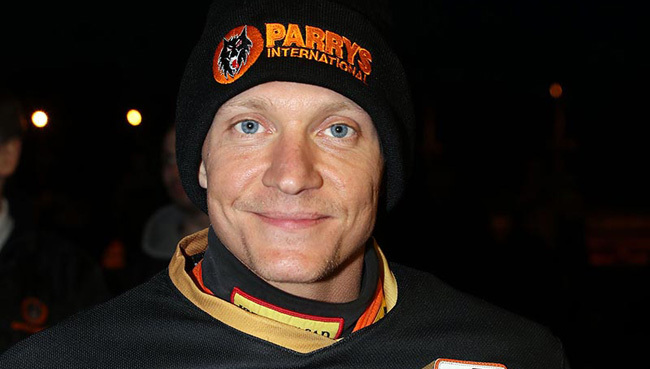 The Parrys International Wolves got off to a flying start with wins in each of the opening four races seeing them open up a six point advantage as they looked to end their 10 meeting winless away run. The Lions hit back with consecutive 5-1s in heats seven and eight to put Wolves on the back foot - but they battled hard to set up a tense last-heat decider in their bid to emerge with a consolation point. Although the flying Jason Doyle stormed to his fourth successive victory, Swedish duo Freddie Lindgren and Peter Karlsson packed the minor placings to ensure they earned a well-deserved point for their efforts. Although slightly disappointed to miss out on victory, team captain Karlsson was delighted to finally see them end their troublesome away form to leapfrog Lakeside and move up to sixth in the Elite League table. Karlsson said: "We're delighted with the point we've got. Everyone was chipping in with points and we did a good job in the end. "It would have been nice to get the win, but after the way our away form has been it was a great feeling to secure a point in that last race. "It was a good team effort, so we are pleased and hoping to carry that confidence through to Belle Vue on Monday where we can hopefully get some more points." Peter Adams' side put in a solid display throughout with Lindgren and Tobiasz Musielak each claiming two wins apiece whilst Jacob Thorssell ended a creditable night with a victory. The experienced Karlsson scored in every ride in the tough No.5 spot, although fellow heat-leader Ricky Wells faded after a classy win in his opening ride. Guesting No.7 Max Clegg added a hard-fought six points, but reserve partner James Sarjeant struggled as the Monmore men were unable to end their losing win away from home. They will nonetheless take plenty of positives from a much-improved away performance and turn their attentions to a tricky trip to Kirkmanshulme Lane to take on play-off chasing Belle Vue on Monday (7.30). LEICESTER 48: Jason Doyle 14, Steve Worrall 10+1, Grzegorz Walasek 9, Sam Masters 7+1, Szymon Wozniak 4+1, Piotr Swiderski 3+2, Simon Lambert 1+1. WOLVERHAMPTON 42: Freddie Lindgren 9+1, Tobiasz Musielak 8+1, Jacob Thorssell 7, Peter Karlsson 6+1, Max Clegg 6, Ricky Wells 5, James Sarjeant 1+1.